Landscape pictures from our fantastic planet. Photo galleries from all 7 continents. Nature highlights from my many journeys around the globe. Photos of wildlife (penguins, albatrosses and more) and landscapes from Antarctica and other remote places like Nepal, South Georgia Island, Falkland Islands and Denmark. My name is Allan Hansen and I live in Arnakke, Denmark. I am a nature and wildlife photographer with focus on bird and animal behavior, and light, composition and beauty in an unusual landscape. Penguins and albatrosses are my favorite nature subjects, and you can find a lot of photos of these fascinating birds in my galleries. I saw my first penguin on a 2 week hiking trip in a very remote place of New Zealand in 1990. It was completely unexpected for me to see a penguin on a forest path. It was a Yellow-eyed penguin and I have been a penguin fan ever since. 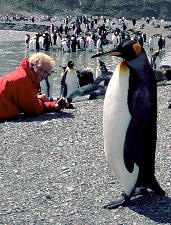 A dream came through when I in 2003/03 got the chance to go on an Antarctic cruise and visited Falkland Islands, South Georgia Island, South Orkney Island and The Antarctic Peninsula and saw millions of penguins and albatrosses. More than I could ever dream of. In 2007/08 I repeated this journey, and this time with my wife. Both trips were arranged by Cheesemans' Ecology Safaris, a high-quality wildlife tour company based in Saratoga, California. Great people and highly recommended.